When the first Atlas 5 rocket vaults skyward a week from today, it will represent the pinnacle of evolution for Lockheed Martin's family of expendable launchers. Born of the U.S. Air Force's competition to develop next-generation rockets, the Atlas 5 is expected to be around through 2020, providing dependable and more affordable access to space over current boosters as part of the Evolved Expendable Launch Vehicle program, or EELV. "EELV is the best of the best that Lockheed Martin and its heritage companies could put together, whether it was an Athena from Lockheed, or Titan from Martin or Atlas from General Dynamics," Atlas 5 developer John Karas said. "It is Lockheed Martin's best attempt at fielding a rocket for the 21st Century." Atlas 5 is built to be more robust and reliable over earlier Atlas and Titan 4 vehicles, and streamlined production has resulted in fewer opportunities for human error. 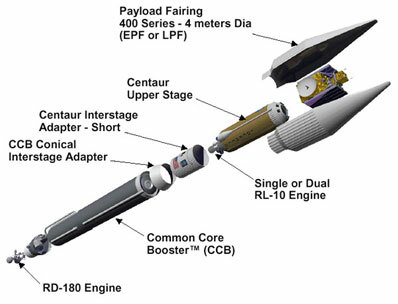 The new launcher builds upon the success of its predecessors, using the same Russian-made RD-180 main engine, stretched Centaur upper stage and its RL-10 engine that have already been proven to work during Atlas 3 flights. The key piece that sets Atlas 5 apart, however, is the new rigid body Common Core Booster that serves as the rocket's first stage. The CCB replaces the "balloon" pressure-stabilized stage used by previous Atlas vehicles. The booster stage is 106.6 feet long and 12.5 feet diameter. As the CCB's name suggests, the stage is common and will be used in all the various configurations of the Atlas 5 family. 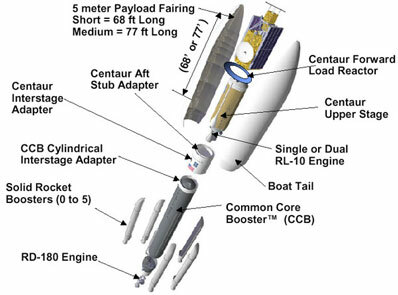 The stretched Centaur also will be common across the Atlas 5 fleet. There are three distinct versions of Atlas 5 rockets -- the 400 series, 500 series and Heavy -- each dedicated to launching a certain class of satellite cargo into orbit. The 400 series uses a four-meter diameter payload shroud; the 500 series features a five-meter fairing. The Heavy is a future Atlas 5 version that would take three Common Core Boosters to form a powerful triple-body rocket. To match an Atlas 5 with the size of its payload, up to five solid rocket motors can be strapped to the rocket to give extra boost at liftoff and the two different types of nose cones are available to enclose the satellite atop the launcher. The Centaur can use one or two engines, depending on what type of orbit the satellite is headed. The various options have prompted Lockheed Martin to give Atlas 5 the nickname "dial-a-rocket" because of its flexibility. Customers can have another solid added to their rocket if the satellite cargo becomes heavier than expected during construction -- a cheaper alternative than moving to a more powerful launcher such as switching from an Atlas 2AS to an Atlas 3A. The first Atlas 5 launch will carry the Eutelsat Hot Bird 6 satellite, an Alcatel-built craft weighing 8,591 pounds at liftoff. Based on that size, the least powerful version of the Atlas 5 -- the 401 configuration -- is capable of delivering the direct-to-home TV broadcasting satellite into the targeted geosynchronous transfer orbit for this mission of 170 by 24,757 nautical miles at 17.57 degrees inclination. The 401 translates to an Atlas 5 with the four-meter fairing, no solid rocket boosters and one RL-10 engine on the Centaur upper stage. The rocket is capable of lofting 10,913 pounds to geosynchronous transfer orbit. Lockheed Martin limits to three the number of solids on the 400 series due to structure loads on the rocket during flight. In addition, payloads that need more lift than three solids inevitably would be large enough to require the wider five-meter fairing of the 500 series. "It is kind of hard to put that much mass in a small payload fairing. So what happens is your accelerations go up really high and you start approaching the limits of your vehicle structurally," Karas explained. "If you put a fourth solid on there, we'd be screaming...already at three solids we are throttled back significantly (on the RD-180 engine)." "You get to point where we got so much more thrust...thrust to weight on that rocket is 2 to 1, it leaps off the pad and it just causes more loads on the rocket." The second Atlas 5 mission, scheduled for this December, will launch the Canadian Nimiq 2 broadcasting satellite aboard another 401-version. The launch of a communications satellite for Inmarsat in late 2003 will use a 431. For the third Atlas 5 next March, a 521 vehicle will carry the Rainbow television relay spacecraft. That rocket will have the five-meter fairing, two solids and one Centaur engine. "Essentially we carry an extra solid to compensate for the five-meter fairing," Karas said. "A 431 is about the same as a 541 because the larger five-meter fairing really detracts from your performance and it takes about a solid to compensate." For payloads heading into an orbit other than geosynchronous transfer orbit, a second Centaur engine is used. "If we were to fly dual engines on a Centaur to GTO, we would actually lose performance because we are dragging an extra engine. We don't need the thrust, so we lose a few hundred pounds of performance," said Karas. "Typically when you want to throw a lot of mass into low Earth orbit and you still have gravity losses, you need the thrust so you need the second engine." Powering the Atlas 5 during the first four minutes of flight is the Russian RD-180 liquid-fueled engine. The liquid oxygen/kerosene powerplant is a two-thrust chamber, two-nozzle engine made by NPO Energomash of Khimky, Russia. It was developed from the RD-170 engine used by Russia's Energia-Buran space shuttle, the Energia-M and Ukrainian Zenit rockets. Featuring hypergolic ignition, the engine produces nearly one million pounds of thrust and is throttled up and down to ease the stresses the rocket experiences throughout the launch. The American propulsion firm Pratt & Whitney financed the development of the RD-180 for the Atlas program. Pratt and NPO Energomash are equal partners of RD AMROSS, the joint venture formed to market, sell and distribute the RD-180 engines. Two RD-180 engines have already been flown on Atlas 3 rockets and 11 more are currently on U.S. soil, Karas said. Six additional engines are due for delivery this year, allowing Lockheed Martin to stockpile them for future use. 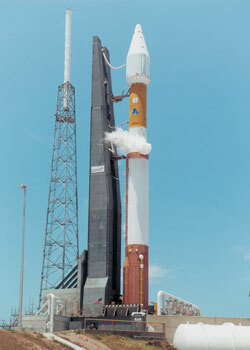 The workhorse Centaur upper stage has been flown in various configurations for decades. For next week's launch, the stage will use just one Pratt & Whitney-built RL-10A-4-2 liquid oxygen/liquid hydrogen engine. The engine develops a thrust of about 22,300 pounds. The Centaur will fire twice during launch, initially boosting itself and attached satellite into a parking orbit around Earth after separation from the first stage. A second burn propels the payload into the planned transfer orbit. The stage is 38.5 feet long and 10 feet diameter. It also carries the rocket's guidance brain -- the Inertial Navigation Unit. Atlas 5 represents the culmination of evolution stretching back several decades to the Atlas Intercontinental Ballistic Missile. For Lockheed Martin, the next step on the futuristic drawing board is likely to be a second-generation reusable launch vehicle, not another expendable rocket that is used only once. "When it comes to expendables, Atlas 5 is about it," Karas said. 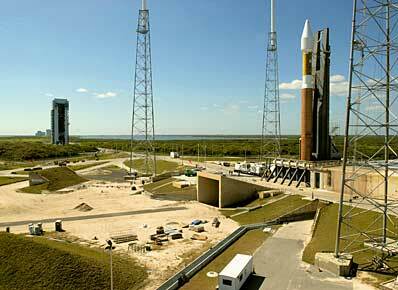 "As always, we have a set of improvements that we would like to phase into Atlas 5. We always try to keep our product fresh. You have to refresh your product or else it dies. There are a bunch of upgrades that we've talked about. You're never perfect. There are some upgrades that help improve reliability and improve operations. Former shuttle astronaut Mike Coats is leading the company's studies of such a reusable launcher, which John Karas hopes will use some of Atlas' technologies. "The big thing Lockheed Martin is working is really second-gen that is not really under the Atlas purview but is under Mike Coats and the reusable launch system guys. I personally think just as we have evolved and used the rule of wing-walking for Atlas 1, 2, 2A, 2AS, 3A, 3B, Atlas 5 400, 500, Heavy, that there is an evolution plan that can bridge the gap between expendables and reusables, probably more than the nation has been focused in on lately. Atlas 5 overview - Our story looking at a new era in American space rocketry.